Protect important pages in a smaller binder without having to punch holes. 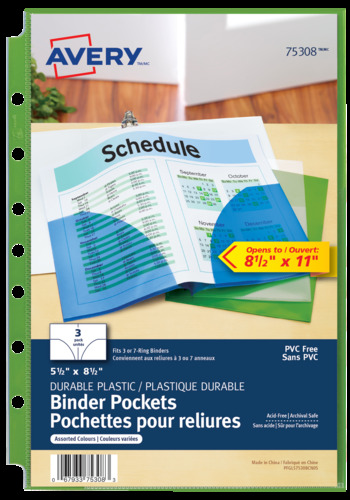 Store up to 20 full sheets of paper in a Mini Assorted Binder Pockets for 5-1/2" x 8-1/2" Binders. Each mini binder pocket opens to 8-1/2" x 11" letting you store business cards, receipts or other important documents without punching holes in sheets. Archival-safe sheet protectors are made from polypropylene and are PVC-free and acid-free. Protect important pages in a smaller binder without having to punch holes. Store up to 20 full sheets of paper in a Binder Pocket for 5-1/2" x 8-1/2" Binders. Each mini binder pocket opens to 8-1/2" x 11" letting you store business cards, receipts or other important documents without punching holes in sheets. Archival-safe pockets are made from polypropylene and are PVC-free and acid-free. Non-stick material ensures print remains on paper instead of on the pockets. The durable binder pockets will resist tearing even with repeated use and are ideal for long term storage. Each pocket is pre-punched for storage in either a three or seven ring 5-1/2" x 8-1/2" binder for easy reference and organization. Each pack includes a blue, green and clear coloured pocket for easy organization. These petite pockets will offer plenty of storage for safe-keeping. Quickly store important documents of all sizes up to 8.5" x 11.5" without having to punch holes in small binders, organizational day-books, calendars and more. Photo pages are strong enough to protect pictures from smudges and dirt.The Clear finish offers a balanced finish of clarity, contrast and minimal glare while viewing your photos.